Nearly 100,000 were injured on trampolines in 2009, the last year for which there is complete data, pediatricians warn. Trampolines are too dangerous for children to use, the American Academy of Pediatrics said Monday. Citing nearly 100,000 injuries in 2009, the academy issued the warning in a statement published in Pediatrics and noted that the safety nets added in recent years don’t make much of a difference. That makes a lot of sense to Carolyn Prouty. Prouty will never forget the day, eight years ago, she saw her 8-year-old daughter Destini bounce off the backyard trampoline and land hard on her head and neck. Prouty rushed over to find her daughter in excruciating pain, arms numb. “My first response was that she was going to be paralyzed, seeing how she landed,” said Prouty, a nurse from Spokane, Wash.
Destini was airlifted to the hospital where doctors determined that she hadn’t broken anything, but had sustained a concussion and a strained neck. But that was enough for Prouty. “It was a big relief to know that she was fine, but I got rid of the trampoline,” she said. Destini had been showing her mom gymnastics moves she’d been practicing when the accident happened. Like many parents, Prouty had assumed that as long as her daughter followed general safety rules such as only one child on the trampoline at a time, Destini would be fine. But even when safety precautions are taken, trampolines can still be dangerous, said Dr. Michele LaBotz, a lead author of the new AAP statement and a sports medicine physician at Intermed Sports Medicine in Portland, Me. And attempts by the trampoline industry to make things safer, like the addition of nets, don’t seem to have made much difference, LaBotz said. They do, however, tend to lull parents into a false sense of security. Parents mistakenly see trampolines as benign playthings, LaBotz said. In fact, data from the National Electronic Injury Surveillance System show that most – 75 percent – of trampoline injuries occur when multiple people are jumping on the mat. In those cases, the smaller child was 14 times as likely as a larger one to be injured. That’s how Brooke Carlson’s 12-year-old son Clay broke his hand five years ago on a friend’s trampoline. It all happened so quickly, said Carlson, a horse trainer from Morgan Hill, Calif.
Carlson had planned on buying a trampoline herself until the accident. “After this I was scared that somebody would get hurt on it,” she said. The NEISS data showed that the youngest kids are at greatest risk for significant injury, including fractures of the legs and spine. Studies have shown that children younger than 6 years old accounted for 22 to 37 percent of all those turning up in the emergency room for evaluation. And NEISS data show that 29 percent of injuries in kids ages 6 to 17 were fractures or dislocations, as compared with 48 percent in kids 5 years and younger. Among the most common injuries in all age groups, include sprains, strains and contusions. Falls from the trampoline accounted for 37 to 39 percent of all injuries and can be potentially catastrophic, the authors reported. Especially frightening was one study cited by LaBotz and her colleagues that found that 1 in 200 trampoline injuries resulted in some sort of permanent neurologic damage. In LaBotz’s experience, even after a kid has an accident, parents will often continue to let them use the trampoline. “There are a number of families, even those with kids who have had significant injuries, who decide they still want the trampoline as part of what they offer to their children,” LaBotz said. That doesn’t surprise Dr. Barbara A. Gaines, director of trauma and injury prevention at the Children’s Hospital of Pittsburgh of the University of Pittsburgh Medical Center. Given that many parents probably won’t be willing to give up the trampoline in their backyard, Gaines commends the AAP for also providing a list of safety measures for people who do continue to use the equipment. Ultimately, the most important thing is for parents to recognize the danger. “When individual families come in with an injured child, it seems to them to be like one of those freak things,” Gaines said. “Everything was fine and then all of a sudden something happened. “But these are not just accidents. There is a pattern to them and there’s something we can do to prevent them. It’s not that we don’t want kids to have fun. But injury shouldn’t be an expected part of childhood." Trampolines should be set at ground level whenever possible or on a level surface and in areas cleared of any surrounding hazards. Active supervision by adults familiar with the recommendations should occur at all times. Supervising adults should be willing and able to enforce these guidelines. Mere presence of an adult is not sufficient. 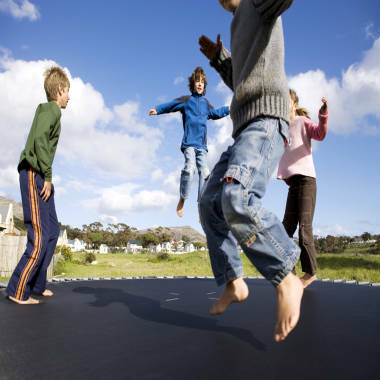 Pediatricians should advise parents and children against recreational trampoline use. Netting and other safety equipment doesn't help reduce injury rates. Failed attempts at somersaults and flips frequently cause cervical spine injuries and can result in permanent and devastating consequences. At trampoline parks, remember that their rules and regulations may not be consistent with the AAP guidelines. Trampolines used for a structured sports training program should always have appropriate supervision, coaching and safety measures in place.